Welcome to Boston Mamas Rock! – where we’re giving a voice to fabulous local mamas, whether they're entrepreneurs, avid volunteers, stay at home moms, moms who have closet talents, authors, media professionals, politicians, professors, etc. Read on for today’s interview with Christine Crowley, mother of two and co-founder of Sugabettens Baking. Then go ahead and nominate yourself or a friend! Christine Koh: Tell us a little bit about your background Christine. Is your baking venture a full-time job or a side passion? Tell us about the path that led you to Sugabettens Baking. Christine Crowley: I have a degree in culinary arts from Newbury College and feel at home in a kitchen. Cooking and baking for people has always made me happy so taking that passion and turning it into a business seemed like the natural path for me. Currently, Sugabettens Baking is a part-time business, but I would like it to be my full-time job once both of my children are in school all day. 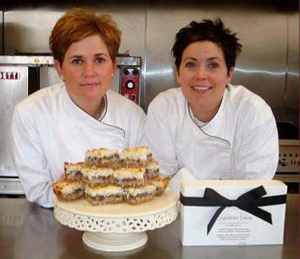 My sister and I started Sugabettens because we really felt we had a product people could count on to be delicious and unique each and every time, and that the integrity of our product, service, and customer service would provide people with value. Koh: I love that your product focuses on secret family recipes. I’ve tried to get my mom to share some of her recipes but my efforts never come out the same (I’ve heard that cooks always leave out a key ingredient when they pass on a recipe…). How did you get your mom to share her recipes? Crowley: My mother has been making her cookie bars this way for about 30 years, so my sister and I started helping her make these treats when we were 10 and 11, and by the time we were 14 or 15 if we wanted these treats, we would make them ourselves. My sister and I have always felt that my mother created the perfect cookie bar recipe and are now so grateful that she was willing to share it with us, and taught us every little secret about creating them. Koh: OK, so I have tried your classic brownies and Sugabettens bars and they are killer decadent. 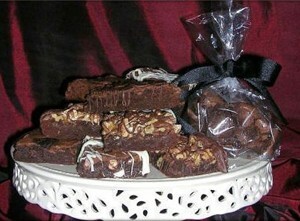 Do you have long-term visions of expanding your product line to include other types of decadent baked treats? Crowley: Yes we do. We are going to add a blondie and dark chocolate brownie to our menu by the end of 2008, and in 2009 we are adding two of my daughter’s favorite recipes we developed: a lemon pound cake and a super moist chocolate cake. Koh: And tell us about your client base; where do you ship to? Do you handle corporate events? Are you planning on getting your brownies and bars into local stores of farmer’s markets? Crowley: Our client base includes people who want to send not just a gourmet gift, but really want to convey to their loved ones, friends, and clients how unique and special they are. We are the only baking company to make cookie bars this way, and for someone to receive a gift especially made for them really makes them feel special. That's our ultimate goal, to make the recipient of our gift boxes feel special. We ship inside the continental United States. We do not handle corporate events but it's not something that we've ruled out. At the moment, we only sell online, but our lemon pound cake and chocolate cake are perfect for coffee shops and local stores and it's definitely something we are going to pursue. Koh: You co-own Sugabettens Baking with your sister. What are the skills that you each bring to the business? Does age order come into factor at all, when it comes time to boss around the kitchen? Crowley: I think owning a business with your sister who also happens to be your best friend has its challenges but also its rewards. I am very impatient and need immediate results and she has a lot of patience and a quiet intensity that just conveys that no matter what, we will get done what needs to be done. I think my tenacity is an advantage in business because it's hard to start and grow a business. We get along really well in the kitchen, we compromise, and we don't take things personally. If there is criticism it's always constructive and never personal. We shared a room growing up, so I think that laid the groundwork for a great business relationship. Koh: I was fascinated to learn about Nuestra Culinary Ventures from your website; I think it’s a brilliant solution to have a professional cooking hub for small-scale food entrepreneurs. How did you connect with them, and how has the experience been? How does the scheduling work since you bake on demand? Crowley: I learned about Nuestra Culinary Ventures in a Boston Globe article. My sister and I were originally going to start this business from my kitchen at home, but soon realized we would be really limited if we did that and we were really thinking we had to have professional kitchen space. The next day I opened the Globe and read about Nuestra and knew we could make it work. It truly is a brilliant solution for aspiring food entrepreneurs. We gave them a call and began the process of getting the appropriate licenses and certifications we needed to open a food business. We then submitted a business plan and met with the director, J.D. Walker, to lay out what our goals were and how we were going to accomplish them. J.D. is very knowledgeable and supportive and really serves as a mentor for the businesses over there. It's been a wonderful experience and without them Sugabettens probably wouldn't exist. We do bake on demand and for right now my sister does most of the baking because I am with my children during the day. Koh: You have two kids; where were you work-wise when they arrived? How did you handle maternity leave time and return to work? Crowley: I was working full time when my daughter was born and part time when my son was born. Maternity leave with my daughter was different than when I had 2 children because I knew what going back to work meant and how difficult in can be to care for 2 small children. My husband is a very involved parent so I knew he would do a great job with them but I also saw the need for more flexibility in my life and that started me on the path to own my own business. Koh: How have you juggled motherhood with your current ventures? Do you have a key piece of advice for aspiring mamapreneurs? Crowley: I am very lucky to have a very supportive husband and family and of course a sister for a business partner who understands the demands of my life. I always try to have balance in my life and really keep in mind that my children are young and need an engaged mom who has time for them. With my children on summer vacation I try to work before they wake so we have plenty of time to get outside and play. To aspiring mampreneurs I would advise them to let go of the toxic, negative people in their lives and really surround themselves with people who support and believe in them. Every business has its set backs and ups and downs, but if you are surrounded by people who truly believe in you, it's much easier to pick yourself up. Koh: We’ve talked all business up to now. Tell us about the favorite things you do to unwind, or any hidden/unusual talents you may have. Crowley: One of my favorite things to do is play a game in my backyard with my kids. It's unusual but they love it! I have a talent for kicking balls really high, so we invented a game where the goal is for me to kick a ball over or as close to the top of our 50-foot tree as possible. If a ball gets caught in the branches of the tree, then I need to use another ball to knock it out. Another requirement for this game is that I use a bare foot to kick the balls. Laughter is truly a great stress reliever! Currently we have no kick balls in our tree. Koh: And finally, what’s your favorite thing about being a Boston mama? Crowley: Boston is a great city and it has the best of the best. The best hospitals, best schools, and not to mention, the best sports teams and sports fans anywhere. Boston is a city of people always trying to be better, make things better - not just for themselves but for everyone around them, and I think Nuestra is a perfect example of this. Being part of the best of the best is a great experience and we're grateful that we've had this very unique opportunity.